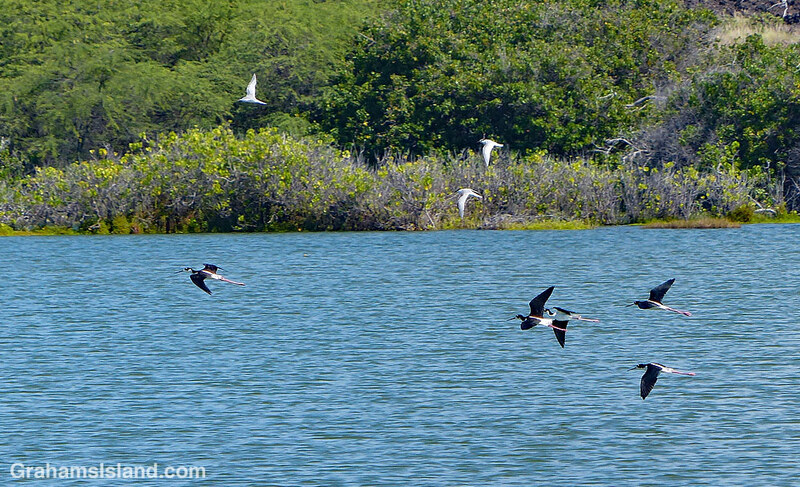 ’Aimakapa Fishpond, in Kaloko-Honokohau National Historical Park, is a good place to see the endemic Hawaiian stilt. Mostly they’re seen wading in the shallows, probing the mud with their long beaks. On this day, however, they took to the air. I enjoy taking photos of birds in flight, but it’s a challenge. Challenge number one is getting them in the frame. Then there’s the small matter of tracking them and getting settings right. I’m constantly experimenting with the best way to get the picture. Usually I find that by the time I’m organized they disappear behind some trees or settle down again on the flats. This time the birds were unusually cooperative. 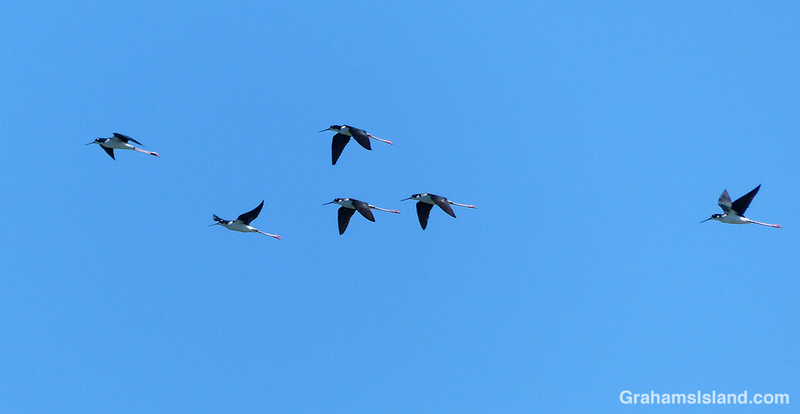 They headed out over the water, circled back and returned from whence they came. And they did this more than once so I was able to get a bit of practice in. I do like seeing birds shot, photographically speaking, against a clear blue sky, particularly the stilts with those long, pink legs. But I also like the context of the water and greenery surrounding the fishpond. I don’t know what the white birds are as this fleeting pass was as good a look as I got. They might be some kind of gull, though gulls aren’t especially common in Hawaii. For more information about Kaloko-Honokohau National Historical Park, go to nps.gov/kaho/index.htm.